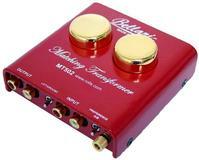 The MT502 is a moving coil transformer that raises the low level of a moving coil cartridge up to moving magnet level. This makes your low-output MC cartridge compatible with a MM phono preamp. The mt502 is entirely hand built in the USA with 100% American made parts right down to its custom hand wound transformers and custom made chassis. The mt502 is as much art as it is audiophile performance. We designed the mt502 with a no compromise mentality utilizing only the best components. Tricked out with 24K gold plated jacks and transformers, military grade double-sided glass circuit board, extra heavy gauge steel chassis and powder coated red finish. The mt502 truly makes a statement in audio perfection.